Sorry no Captain Spectre update this week. I tried to pump one out, but it just didn't happen. Sometimes as we all know things just don't work out. I do however want to invite you to the process of doing a story. I am posting the thumbnails of the KiGor story that I am drawing for Moonstone. The story is by Martin Powell, my friend and most excellent author. I hope posting the thumbnails doesn't give it away. Ha. I don't imagine anyone can decode these thumbnails. I am sure you have all seen this stage of story development on other blogs from much better artists. But I felt an update was needed, so this was all I had....unless you want to see layouts from a science comic about the flu virus! I just wanted to post these, to start the process off. I will be starting work on these pages, penciling and inking, shortly. 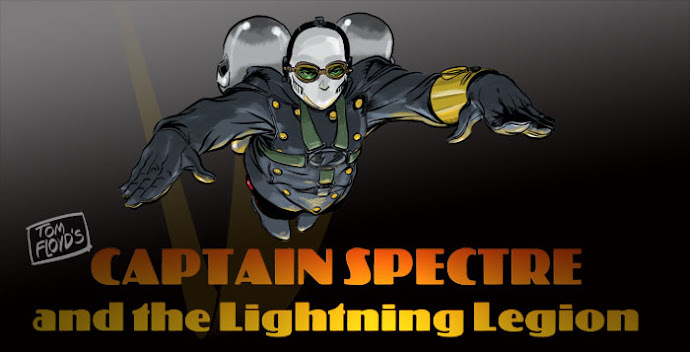 The cliffhanger for Captain Spectre is coming fast, and since after that cliffhanger you readers voted to have me work on a stand alone Captain Spectre book - that is what I am going to do. Of course I will be thinking of the writing of that story as I draw the pages for KiGor. Believe me it all dovetails together. 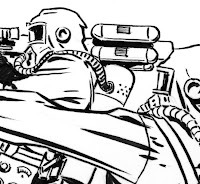 Well Loyal Legionnaires, and loyal readers...yet another update. As I mentioned before I am trying a larger working size. Boy does it ever help. I was never much for drawing small. And now that my eyesight is working through 57 year old eyes, it isn't easy working small. These panels were drawn in the old size of Caniff dailies. Maybe even just a tad bigger. These panels are 8 inches high. I think the old dailies were drawn at 7 inches. I may drop back to the 7 inch mark next time. As always doing this strip is a huge experiment for me. Writing, and drawing and inking can always be improved. So I try to each time. I hope the effort shows a bit. It sure helps with the backgrounds and staging to have more room to work with, and then I can still use my brush. My truck is still in the shop, so I will be working from home on Monday also. I sure hope they don't just decide to fire me. Hell I get much more work done at home. None of that drive into work and home, I get up and get right to work. I think I proved myself working on the animated mammoths I did for NOVA. I will keep you informed. Well, I think I will continue to post updates here at the blog too. That way Loyal Legionnaires can get everything in one click, instead of all that tiresome clicking around on the Internet Hiway. So today finally after around 100 updates/strips/pages/whatever....we finally get to meet the bad guy. The head bad guy. I tried to make this guy different from all other bad guys. At least his motives and problems. We shall see what you think as it is all revealed in the time to come. Anyway (drum roll, please) .....meet the WarMaster!!! Hey Loyal Legionnaires, I am posting this weeks strip a bit late. I didn't have internet access thru the weekend so I couldn't post until this evening. I do apologize. But now I am back up and running...so posting the strip here, and at the regular site too. I almost got to post from work today but just got so busy I couldn't break away to post it here. But here it is Loyal Legionnaires. This week I am returning to the 'daily' format for a bit. The pages will be full size as the strip calls for it. I am also experimenting with drawing at a larger size. More along the lines of the large Prince Valiant original sizes by Hal Foster. But a bit more on that as I figure out the sizes and the best format for doing that. Well things are moving again. The flow is starting to return at a regular rate. 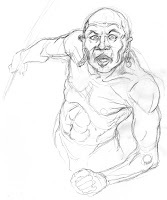 Last night I started working on some natives of KiGor's Africa. Martin and I both want it to be a very primitive and scary place. I think we both thought of Skull Island as an example. I also thought of the great Burroughs novels. Also sometime in the last couple of days TCM showed 'Trader Horn' the original. Well the Harry Carey one anyway. And such great footage was shot for that film it is an artists feast looking at all the different natives. I will probably pull out some of the Weissmuller Tarzan's today too and watch a couple of those again too. Even tho those natives are a bit tamed down, costume wise than the ones in Trader Horn. I do plan on doing this KiGor strip to the best of my ability. As you can see I am experimenting a bit with thinner body types, I plan on working with age and tribal markings like scaring and all too. Should pull out my copy of 'King Solomon's Mines' too, the Stewart Granger one. 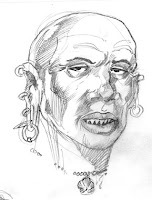 KiGor's jungle will be a dark, scary, primitive, mystical, prehistoric primeval place, I hope. So stay tuned here for KiGor concepts and things also, along with Captain Spectre stuff as I finish up Chapter 4 and move on to the stand alone issue. I was thinking about trying to post things about the stand alone step by step, but I also want it all to be a surprise to the readers and Loyal Legionnaires. So tell me Loyal readers, would you want a blow by blow account of each strip as I go along, or would you rather be surprised all at once? I will leave it up to you fans. Oh also, it is kind of tough thinking and drawing Africa when it is still snowing outside. Sure wish it was summer weather right now, sure would help. Traditions but no resolutions....Happy New Year! Happy New Year, everyone....and especially Loyal Legionnaires out there in Internet land. At a time when people have traditions, and make new year resolutions I thought maybe I would come clean about a few I have. Not resolutions, because I never make those. I used too but something always got in the way and they never worked out. So started feeling what is the point. I really only ever wanted to do one thing in the world, even as a kid, and that was to make comics. Or maybe better stated to earn my living off of making comics. Well no matter how hard you try sometimes wishes don't work out. But, that shouldn't stop a fella from trying. So rather than resolutions I tried traditions. I have a few that I have developed over the decades. One is to be at my drawing board working when midnight strikes. Another is to watch King Kong, and King of the Rocketmen on new years day, while I work. Sounds simple right? Well this year they were. Most people I know don't understand my passion for working on comics and such. But, it is me...it is what I am, what I do, and what I want to do. My mom used to have a couple of traditions. One she adopted when we moved to Texas when I was a kid......black eyed peas, yuck. She would always fix them for new years, said we would have luck. Well black eyed peas is not one of my favorite bean creatures, so I guess why I never had much luck, other than Floyd luck - which in not a good thing sometimes. So Loyal Legionnaires whatever your traditions are, I do wish all a Happy New Year! Also an interesting note is I am finally pulling out of my creative funk, depression, whatever you wish to call it. I am moving toward the end of Chapter Four of the strip. Working on the stand alone story, the writing so far. Since I am not really a writer, I find this process the hardest next to finding the time to do all the other work. I am also beginning to design things for the Moonstone KiGor story. Which I just received from Martin Powell, the writer. So things are cooking and brewing around here, and moving. The Secret Headquarters of the Lightning Legion is up and running again....a bit slow but running. Now off to cook some food for the day....work at the drawing board....watch Kong....and enjoy the entire serial - King of the Rocketmen!!! Have a great new year all!!!!!!! !